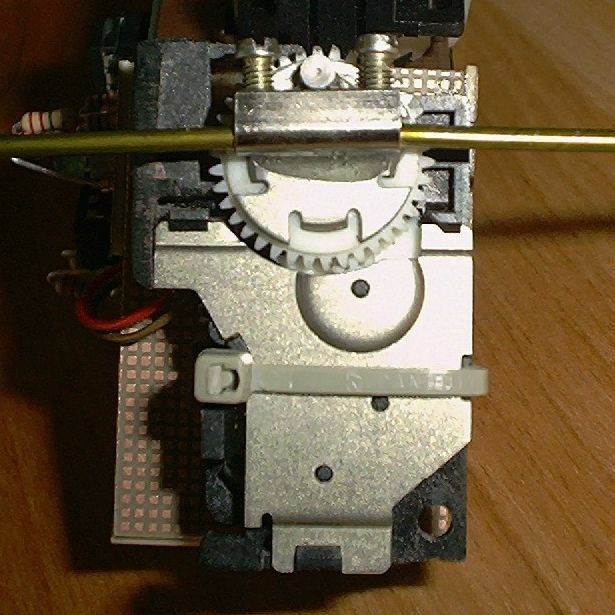 A fair number of BEAMbots use a surplus Macintosh computer floppy eject motor (in particular, the eject motor from Sony-manufactured Mac floppy drives) as a gear motor. These motors have a lot going for them -- they are strong, efficient, and (at least for the time being) easily available at swap meets and on auction sites for just a few dollars. The purpose of this tutorial is to show you how, starting with a surplus floppy drive, to yield a motor ready for installation in your robot. First off, you need to find a floppy drive for an Apple Macintosh computer (you can still find these, although they'll be getting scarce soon since floppy drives are no longer being made). Mac floppy drives start out in a 4-sided case. You'll need to unscrew 4 Phillips-head screws (2 on each "edge" of the case), then pry the drive guts out of the sheet-metal case. I have yet to find a use for the casing, so I just throw it away. 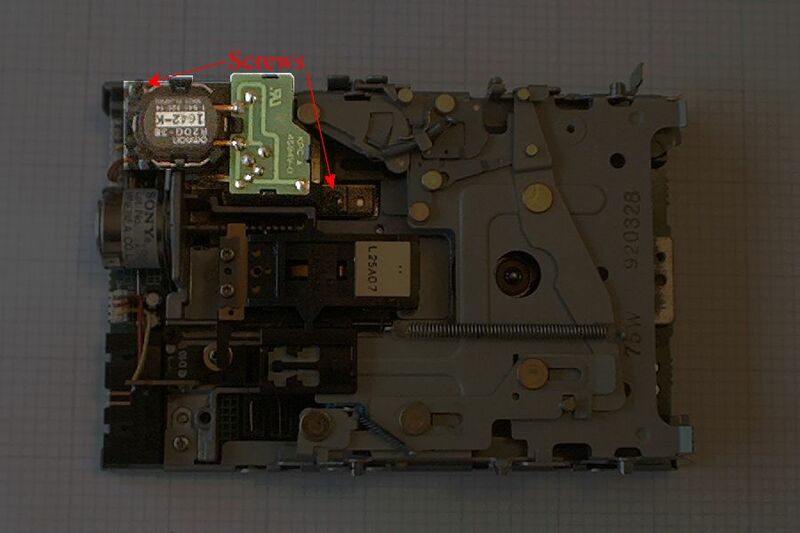 This picture shows the "interesting" face of a cased floppy drive; the eject motor is on the back face of the circuit board. Flip the internals over, and you should see something like this image. I've attempted to highlight the motor; I've also shown the two Phillips-head screws that hold the eject motor in place. Remove these screws and wiggle the motor free. Now take a small flat-blade screwdriver, and pry the motor's plug free from the jack. If you do this carefully, you can reuse this jack on your 'bot. Your motor is now ready for your attentions. Don't throw the rest of the drive away -- there's plenty more you can use (tho' of course, it's not the subject of this tutorial). You'll find one of two types of motors in these drives -- note that the differences are subtle, both types have the same Omron model number (R2DG-38), and they're about 95% identical. The biggest difference between the two is that one type has a metal plate on the face of the output gear, while another does not. Let's call these two motor types the "metal" and "plastic" versions, for short (we'll be referring to these types, and some other subtle differences that go along with them, later). When you work on one of these motors, it'll most likely be a plastic version; they seem to be more common, and I suspect they're a more-recent version. Here's your freed motor. Carefully wriggle the little 3-wire harness out of the clips that hold it next to the motor. You'll need to undo the latch and (patiently) pry up the little circuit board. This requires a bit of care as things are pretty stiff to start, but once you get past a certain point, the board suddenly just comes free. Here's what the underside of the circuit board looks like. You need to remove the limit switch and resistor(s). Here's where metal vs. plastic bit comes in again -- the metal variants have two resistors here, the plastic ones have just one. The resistor(s) is there for the motor's original use -- it allows the motor to stop precisely and reliably when power is removed from the motor. We don't need this, and besides, the resistor(s) waste a lot of power while the motor's running. 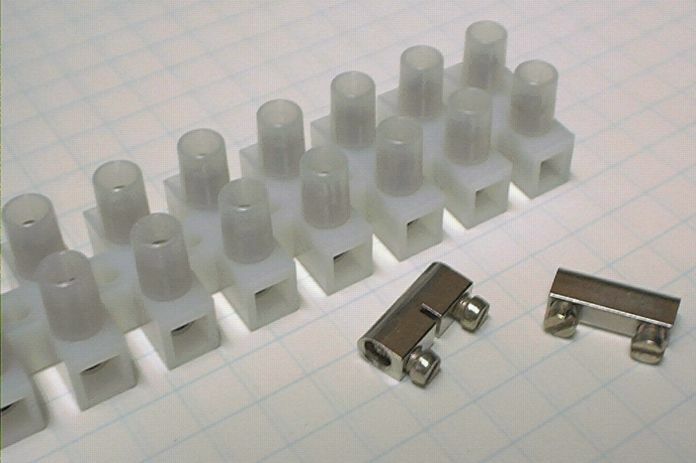 I desolder the resistor(s), then clip the limit switch off with cutters. It's good practice (i.e., cheap insurance) to install a filter capacitor across the motor's power leads. You can put this right where the resistor was (so it's a good idea to desolder this component). These motors put very little ripple on their power lines; accordingly, you don't need much of a capacitor to filter it -- I generally use 0.22 uF -- but it must be a non-polarized cap. 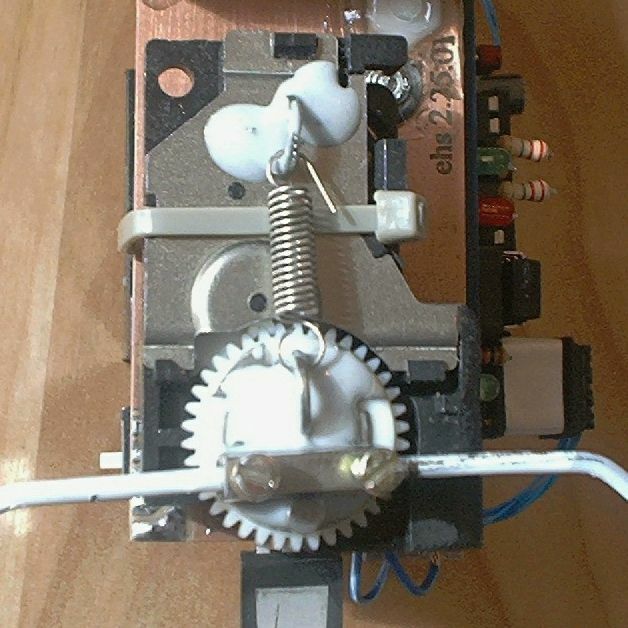 For CCW rotation (facing the white output gear, with the metal "nub" pointing at you), connect the red wire to positive voltage, and brown to negative (or ground). For CW rotation, just reverse this polarity. At any rate, gently push the circuit board back into place (it'll snap in), and give the exposed solder joints a thick coating of "Plasti-Dip" (a piece of electrical tape will also work) so the joints can't short anything out when you put it on your 'bot. Two connection methods; on the left, with new wires; on the right, with the original brown and red wires. I always cut off the crosshatched pieces in this drawing -- it makes the motor a bit smaller, and less cumbersome (so it's easier to mount on a 'bot). I do this with a band saw (I also tinker in woodworking, so I already have one); if you don't have a band saw, a hacksaw and file will do. If you're building a 2-motor walker, one motor will definitely need a centering spring; the other probably won't (so long as its rotational axis provides "lift" for the 'bot). Just to be safe, I'll cover both. Meanwhile, you may be using this motor on a head, so I'll cover that as well. If you're using this motor in a walker, you'll need some way to attach legs to it. I use the cores from "European-Style Junction Strips." These allow you to attach two separate legs to one motor, which gives you lots of flexibility in leg design. They also attach to motors easily with epoxy. On a 2-motor walker, at least one of your motors will need centering springs. To give these attachment points, I use "split ring" washers (modified, of course). I put them in a vise (stout pliers would work too), then bend the ends of the split in opposite directions to give the surviving part of the washer "feet." I've got unmodified and modified washers in the image at right. You'll need 2 of these modified washers for each motor that'll get a centering spring. I use different mounting hardware if the motor is destined for a head -- a flathead machine screw, washer, and nut (the washer's there primarily to give you more metal surface to epoxy to). This allows you to attach the motor shaft to a base by just using washers and two nuts on the screw's shaft. For this particular use, a plastic-face drive motor is easier to work with, since you'll have to remove the "nub" from the gear face in order to epoxy the screw to it. Now prep your parts for gluing -- the surfaces you want the epoxy to "grab" need to be roughened a bit (via sandpaper), cleaned, and degreased. For degreasing, I use rubbing alcohol on a clean rag. Now just glue your parts together. For what it's worth, I use a type of epoxy made primarily for metal bonding for this work. It seems to work a bit better, doesn't cost much more, and is as easily available as the regular stuff. When you're done, your final result (for a walker motor with centering spring) will look something like this. These motors have a lot of odd, lumpy protrusions on all sides, so they can be challenging to mount to a 'bot. I've found a method, though, that works for me -- using a rubber, self-adhesive "bumper" (the thin, flat, disk-shaped ones, not the round "bumps") and cable ties. This step is easy; just put one of your self-adhesive bumpers on the motor's circuit card. You now have a relatively flat surface on the back of the motor (plus you've got a resilient mounting point in the form of your rubber "bumper"). Just use a small cable tie to hold the motor in place. As you tighten the cable tie, the rubber "bumper" will compress, and the motor will twist a bit until it is in a flat position. Here are two examples of motors mounted using this method.